iTunes 7.7 has been released! I am happy to announce that iTunes 7.7 and Windows Vista x64 work well together. The Apple downloader even chooses the correct 64-bit version of iTunes through every browser that I have tried, so they obviously fixed something where you don't need to download iTunes through the 64-bit version of IE. No word yet if the iPhone 2.0 or 1.0 will work with the 64-bit version of windows. As far as I can see nothing is really new with the application. The only noticeable things is that the "Games" menu item has now been changed to "Applications". So if you were expecting a huge jump forward in functionality you are going to be bummed. Most of the changes probably went to support their new Mobile Me platform, push applications, and the iPhone 2.0. 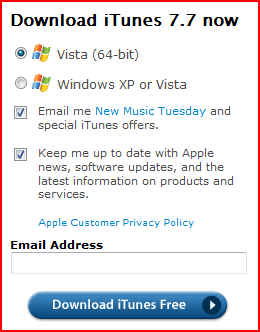 You can download iTunes in the normal places, either through your updator or from their website. My recommendation is to wait to see, if you don't need the new functionality.